Adolphe Léon Willette. Original stone Lithograph in B&W on wove paper. Il s'agit d'un original et pas d'une copie ou d'une re-impression. This is an original print not a modern reprint! Size of the sheet : 7 1/2 x 10 1/2 in. T.A. Steinlen. Original stone Lithograph in B&W on wove paper. 0 - 0,5 kg. 0,5 - 1 kg. 1 - 1,5 kg. 1,5 - 2 kg. Size of the sheet : 7 1/2 x 10 1/2 in. /19 x 27 cm. Henri Fantin-Latour. Original stone Lithograph in B&W on wove paper. Il s'agit d'un original et pas d'une copie ou d'une re-impression. This is an original print not a modern reprint! Size of the sheet : 7 1/2 x 10 1/2 in. Émile WERY. This is the larger format from the deluxe edition of the famous portfolio "L'estampe Moderne". Original stone Lithograph (LARGE SIZE). THIS IS NOT A MODERN RE PRINT OR COPY ! This is an original print not a modern reprint!
" Fleur de Mai". Henri Héran. 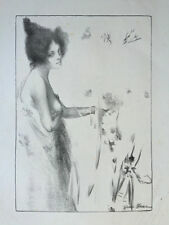 Original stone Lithograph (LARGE SIZE). in b&w on japan paper. JAPAN & AUSTRALI A. Il s'agit d'un original et pas d'une copie ou d'une re-impression. This is an original print not a modern reprint!
" Soir D'octobre". Ernest Laurent. This is the larger format from the deluxe edition of the famous portfolio "L'estampe Moderne". Original stone Lithograph (LARGE SIZE). THIS IS NOT A MODERN RE PRINT OR COPY ! This is the larger format from the deluxe edition of the famous portfolio "L'estampe Moderne". Original stone Lithograph (LARGE SIZE). THIS IS NOT A MODERN RE PRINT OR COPY ! This is an original print not a modern reprint! Eugene Grasset. Original stone Lithograph in B&W on wove paper. Il s'agit d'un original et pas d'une copie ou d'une re-impression. This is an original print not a modern reprint! Size of the sheet : 7 1/2 x 10 1/2 in. Auguste Lepère. This is the larger format from the deluxe edition of the famous portfolio "L'estampe Moderne". Original stone Lithograph (LARGE SIZE). THIS IS NOT A MODERN RE PRINT OR COPY ! This is an original print not a modern reprint! Charles Leandre. Original stone Lithograph in B&W on wove paper. Il s'agit d'un original et pas d'une copie ou d'une re-impression. This is an original print not a modern reprint! Size of the sheet : 7 1/2 x 10 1/2 in. Jean Veber. Original stone Lithograph in B&W on wove paper. This is an original print not a modern reprint! THIS IS NOT A MODERN RE PRINT OR COPY ! Il s'agit d'un original et pas d'une copie ou d'une re-impression. Paul Renouard. This is the larger format from the deluxe edition of the famous portfolio "L'estampe Moderne". " Avant le Ballet". Original stone Lithograph (LARGE SIZE). THIS IS NOT A MODERN RE PRINT OR COPY ! Charles Leandre. This is the larger format from the deluxe edition of the famous portfolio "L'estampe Moderne". Original stone Lithograph (LARGE SIZE). THIS IS NOT A MODERN RE PRINT OR COPY ! This is an original print not a modern reprint!
" Cité Lacustre ". Fernand Cormon. This is the larger format from the deluxe edition of the famous portfolio "L'estampe Moderne". Original stone Lithograph (LARGE SIZE). THIS IS NOT A MODERN RE PRINT OR COPY ! Alexandre Lunois. Original stone Lithograph in B&W on wove paper. Il s'agit d'un original et pas d'une copie ou d'une re-impression. This is an original print not a modern reprint! Size of the sheet : 7 1/2 x 10 1/2 in.